It’s time the world understood the true importance of music education. Marching Beyond Halftime is a documentary feature film being created to show the benefits of music education in our schools. It is the world’s first wide release documentary on this subject. Help us spread the word about the importance of music education! From discipline to listening to teamwork, Marching Beyond Halftime will showcase what a great music education can do for people of all ages. The film will explore the skills and bonds created in a student's music education, influencing the rest of their lives no matter what path they take. The film will introduce outstanding high school band programs in the United States in addition to featuring alumni from all walks of life who have benefitted from being in band. We've been overwhelmed by the outpouring of support from all over the globe. With your help, we have been able to put together a few short trailers showcasing some of the work we're doing on the project. It is vital that our documentary captures the finest examples of America’s leading public school music programs. Our goal is to showcase not only outstanding high school band programs in the United States, but also to feature alumni from all walks of life who have benefitted from being in band. We have worked with the Lake Brantley High School band program from Altamonte Springs, Florida this past year, and are now thrilled to be working with the Carmel High School Band from Carmel, Indiana. The funds we raised so far enabled us to do several multi-camera shoots with the Lake Brantley High School marching and symphonic bands, more interviews with alumni, educators, band students, parents, and even a feature on the Bear Lake Elementary School music program led by the spectacular Dr. Artie Almeida! Marching Beyond Halftime is a documentary feature that will show the importance of a solid music education. With your help in producing the film, we will deliver a copy of the film to every single member of the United States Senate and the House of Representatives. The response we received from the first phase of our fundraising campaign was incredible! People are very excited about this project and we have accomplished quite a bit in the past several months. We put together this teaser trailer to give you a small preview of what we’ve been shooting and working on! Music and arts programs are being cut throughout the country. Countless studies show the lifelong benefits of these programs are vast. What other academic subject or activity engages the whole brain and, in the case of marching band, the whole body? Something must be done. With your help in producing the film, we will deliver a copy of the Marching Beyond Halftime to every single member of the United States Senate and the House of Representatives. We will also work to provide this film to each state’s legislators and policymakers, as well as the local school boards who control the budgets for many of our schools. My name is Sara Flatow and I’m a producer living in Los Angeles. I have been in the entertainment industry for 24 years and have spent the last 10+ years creating behind the scenes content for many popular television shows and films. My latest projects include Grey’s Anatomy (2005—present), Scandal (2013—present), and How to Get Away with Murder (2014—present). I am also a proud member of the Producer's Guild of America. Feel free to check out some of my work at www.SaraFlatow.com! I grew up in Orlando, Florida and I was in band from the seventh grade through college. I have so many fond memories. —from perfecting my clarinet embouchure to marching in front of thousands of screaming football fans. I had the time of my life, made lifelong friends, and I cherished every moment. I knew band was fun and good for me, but I really didn’t understand the impact it had on my life until much later. 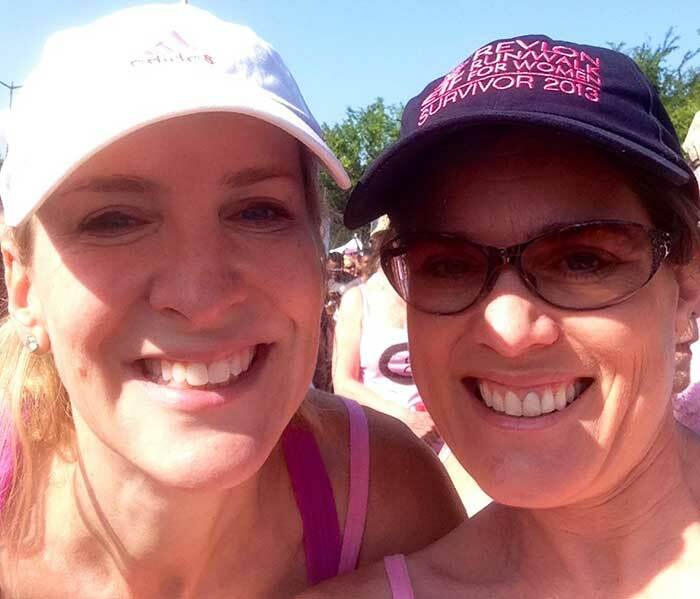 At the finish line of the Revlon 5K walk for Women’s Cancers with my surgeon Dr. Lisa Cassileth. In January of 2012, I was diagnosed with breast cancer. This sent me on an unprecedented journey that took everything I had to get through. All the skills I developed in band—including determination, listening, and resilience—proved critical in my fight. After nine surgeries and countless procedures, the power and importance of music education has never been more clear to me. Over and over I hear stories just like mine—people with real-world challenges who derive strength from their music. It pains me to hear that arts programs are being cut. Together, we can do something about this. Our goal with Marching Beyond Halftime is to show what music education can do beyond the typical halftime show. Far too many people (including those making budgetary decisions) think band is simply about entertaining a crowd during halftime at a football game. They don’t know any better. And that’s on us. With your help, we will complete Marching Beyond Halftime and get the word out about the positive impact of music education! professional having served as the long-time president of Bands of America and now as the founder and President of The National Association of Music Parents. 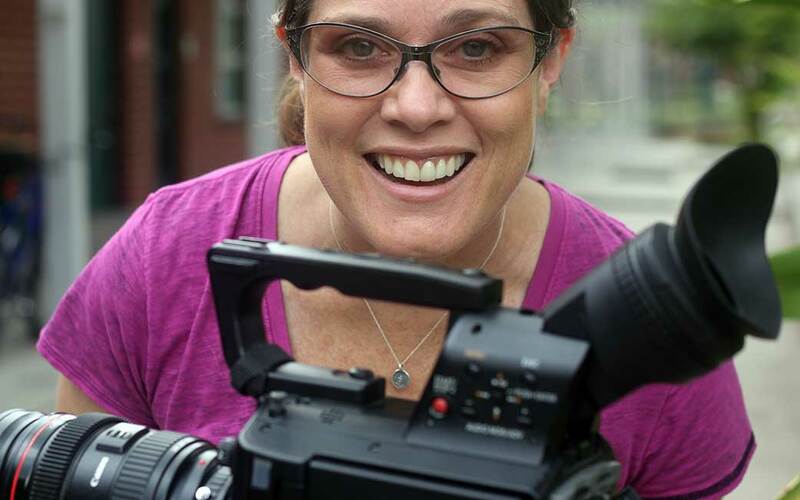 In addition to serving as an advisor on the documentary’s educational and advocacy content, McCormick will oversee the production’s private funding. McCormick has brought to the documentary’s national marketing efforts the support and partnership of The National Association of Music Parents, a nonprofit, charitable organization. AMP will serve as the nonprofit fiscal agent for the film allowing people to make charitable contributions to the project. Our goal is to raise significant funds for production-related expenses. This will enable us to shoot interviews with experts, educators, students, and alumni around the country, as well as additional multi camera shoots with participating bands. Become a contributor of Marching Beyond Halftime! Now accepting tax-deductible donations to the project through the Players Philanthropy Fund. Optional: Contributors can select one (or more!) of the perks below based on your contribution amount. Your name will be listed on our contributor page—unless you opt to remain anonymous, of course! You will receive either a digital download or DVD (to be determined later) of the Marching Beyond Halftime film. See your name, family name, or business name immortalized on the silver screen with a "special thanks" credit at the end of our film! You can honor this wonderful American tradition by wearing this vintage t-shirt, designed by one of the Lake Brantley band students. Thanks to you, we are able to capture stories about how band has impacted people's lives. You will receive bonus material that does not make it into the film! Now, you can make a tax-deductible contribution to the film through our nonprofit partner AMP – The National Association of Music Parents. Gifts of $500 or more will include your name, family name, or business name immortalized on the silver screen with a "special thanks" credit at the end of our film! consider a major gift, please contact us and give us a little information and we will reach out to you immediately.